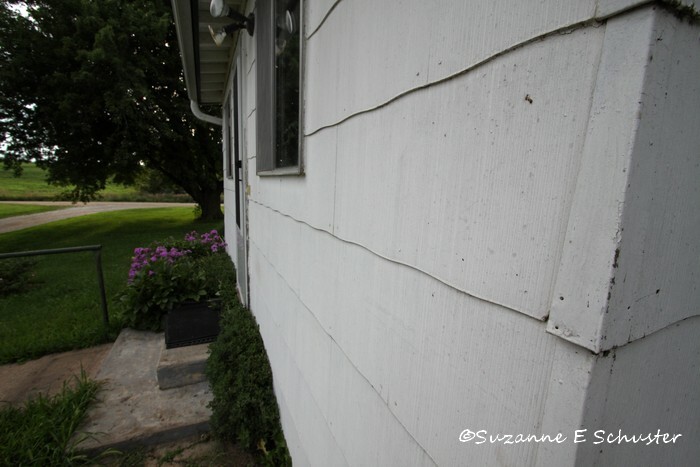 It’s time to tackle a project we’ve been putting off for some time: new house siding. Our current siding is slate which Harland painted when he bought the house about 10 years ago. And beneath the slate is the original wood clapboard siding. There is no vapor barrier, meaning our house is drafty and expensive to heat and cool. So we’re going to put on a vapor barrier, a layer of foam-board insulation, and finally the vinyl siding. Like any older home remodeling project though, we have to take care of a few side projects before we do the siding. First we have to get rid of the old basement stairway entrance on the east side of the house. 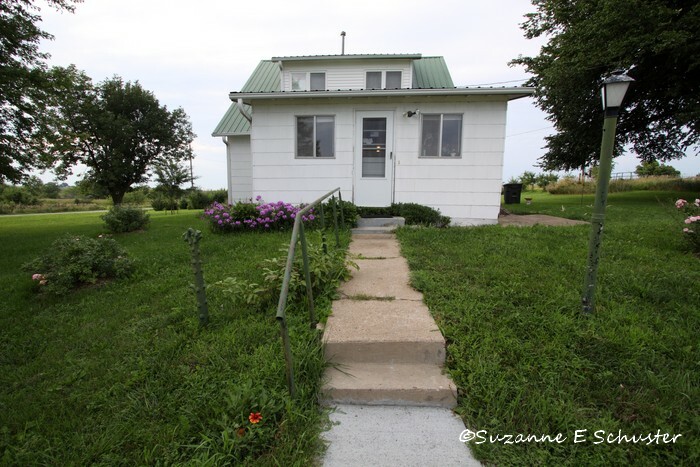 When Harland first bought the house, the plumbing in the basement kept freezing near this entrance. Since there are 2 other entrances to the basement, one from the inside in the kitchen and one from the outside on the north side, Harland went ahead and blocked up this east entrance. 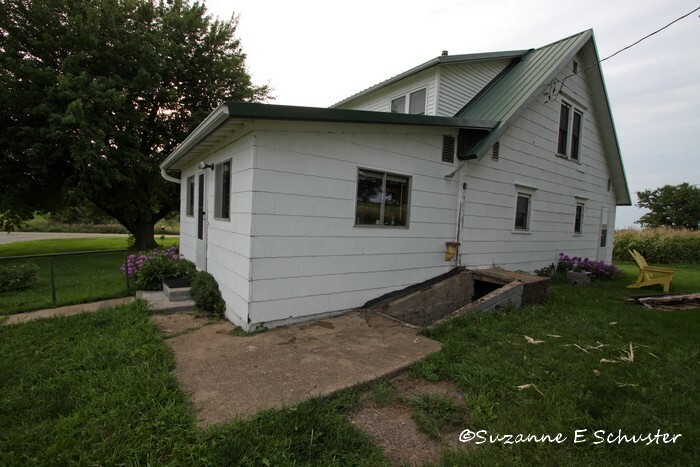 Now we need to remove the above-ground part of the stairway because it comes up above the siding and is in the way. So today Harland has rented a bobcat with a jackhammer attachment to break up the concrete. Then he’ll bring in some fill dirt for the stairway. 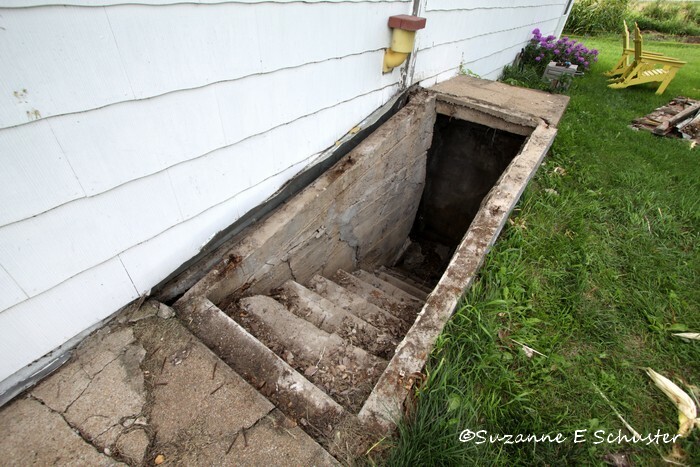 While he’s at it, he’s going to take out the small patio near the basement stairway today.Because of settling, rainwater runs toward the house. We’ll be putting in a new larger patio where we can put a few chairs, a table, and the bbq grill. And Harland’s also going to take out the front sidewalk today because it’s broken in several places and is becoming a trip hazard. Besides the siding, new patio, and sidewalk, we’re also going to trench in the electric line that goes from the pole to the house. No more worrying about the tree limbs in the line or ice storms taking the line down. Besides just general stress from the mess that any remodeling project brings, this one has an extra stressor for me. All my flowerbeds are right up against the house which means all the plants will be trampled. There’s no way around it. I’m holding out hope though that since we’re at the end of summer, they’ll not care too much about being trampled and will be back next spring. I hope…. I’ll share regular updates with you as this project progresses along.